Rapidly burial (to preserve it). Burial in mud or other sediment (for mineral replacement). The worldwide flood rapidly buried millions of plants and animals, creating the right conditions for fossils to form. Typically when an animal dies, it decomposes or is scattered by scavengers over time. 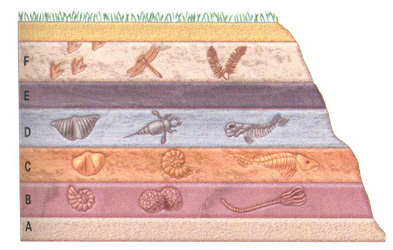 However, the fossils found in sedimentary layers were buried instantly. 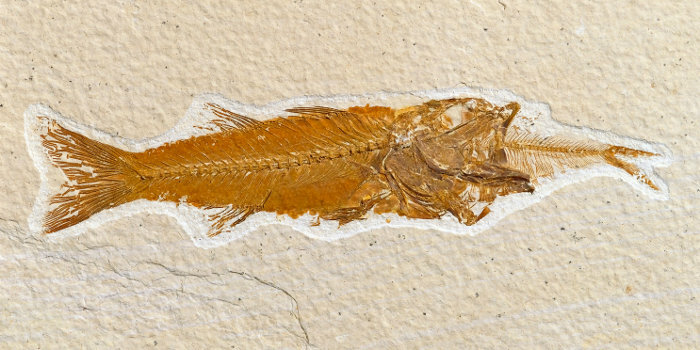 Fossils such as fish eating or giving birth appear to have been frozen in time without warning. Fossilized jellyfish must have been rapidly buried because their soft bodies float and decay within hours of death. The top mile of the Earth's surface is covered with sedimentary layers full of fossils that could not have formed by a slow and gradual process. Fossil Diplomystus dentatus with Knightia fish in its mouth. Fossil Ichthyosaur that was buried while giving birth. The worldwide flood would have buried plants and animals based on their habitat and sorted them based on density and mobility. The reason clams and trilobites are at the bottom is because they live at the bottom. The reason humans and birds are on the top is because they live on the top and are mobile enough to seek higher ground. Many times the evolutionary “ancestor” is found in higher strata. 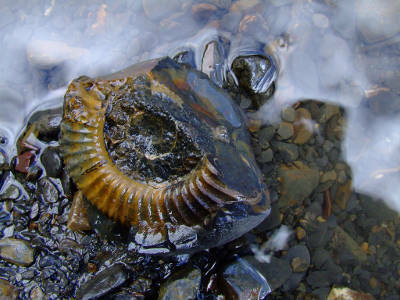 The “fossil record” in reality does not “record” any information on the age of a fossil, but it is evidence that there was a large amount of water. Genesis 7:20 says that during the flood, all the mountains were covered with water. Clams, ammonites, and other marine fossils are found in almost all sedimentary layers, including on top of the Himalayas, Andes, Rockies, and most other mountain ranges. At the end of the flood, crust movement folded the mountains, pushing the fossil layers up to 2 miles above sea level. The catastrophic flood is the reason why the majority of marine fossil layers are found on the continents, and not in the ocean basins. 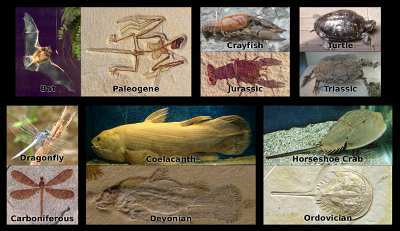 Bats, crayfish, turtles, dragonflies, coelacanth, horseshoe crabs and many other fossils have been found showing no signs of evolution. Almost all fossils, including those in the lowest layers, appear abruptly and fully formed, showing no sign of evolution. These fossils have no transitional forms, and many of them have survived almost unchanged until today. 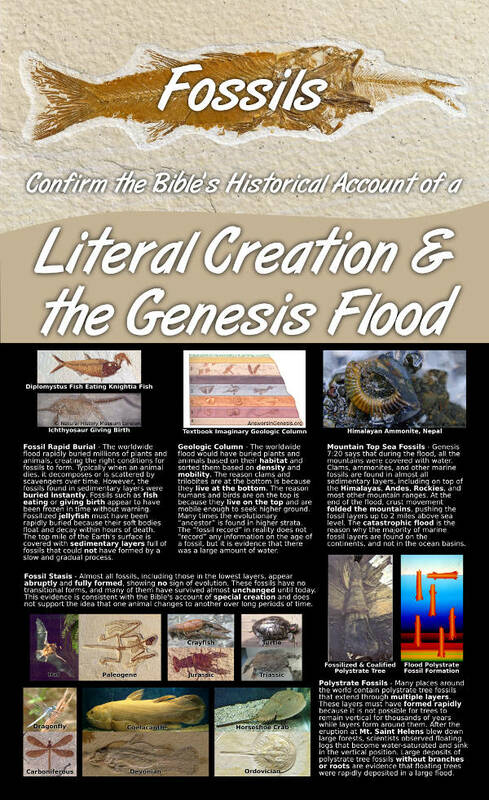 This evidence is consistent with the Bible's account of special creation and does not support the idea that one animal changes to another over long periods of time. Polystrate fossil tree. Top has been petrified, bottom has been turned to coal. 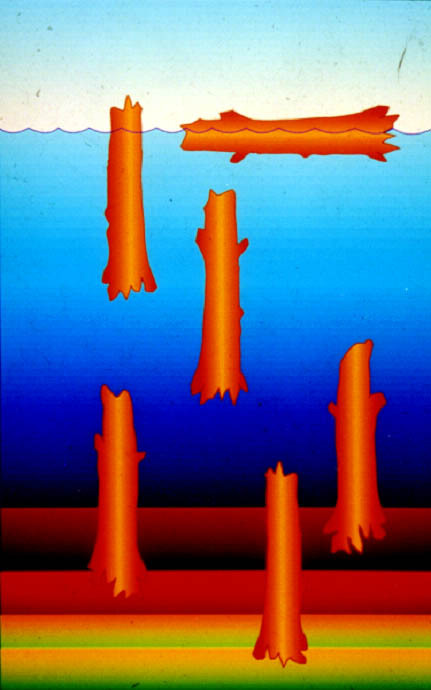 Trees sinking into sediment forming polystrate fossils. 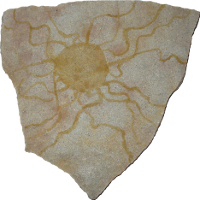 Many places around the world contain polystrate tree fossils that extend through multiple layers. 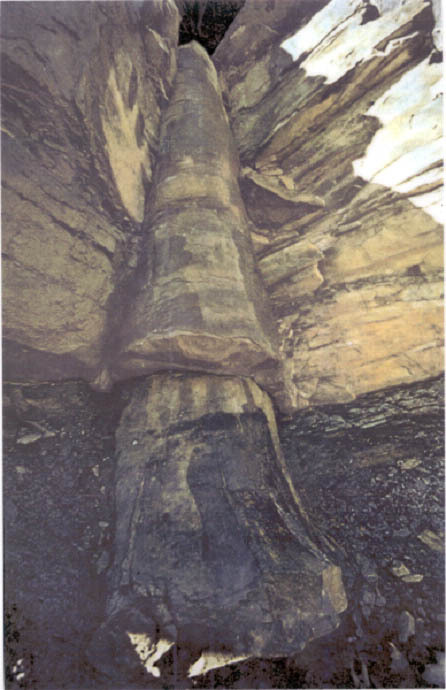 These layers must have formed rapidly because it is not possible for trees to remain vertical for thousands of years while layers form around them. After the eruption at Mt. Saint Helens blew down large forests, scientists observed floating logs that become water-saturated and sink in the vertical position. Large deposits of polystrate tree fossils without branches or roots are evidence that floating trees were rapidly deposited in a large flood. Images from nps.gov and wikimedia.org.